freshly scrambled eggs, shredded hash browns, chorizo sausage and cheese in a flour tortilla. Served with sour cream and salsa. scrambled egg whites (or whole egg), choice of meat, fresh spinach, and shredded mozzarella cheese served on a toasted English muffin with a ‘schmear’ of our chive cream cheese. 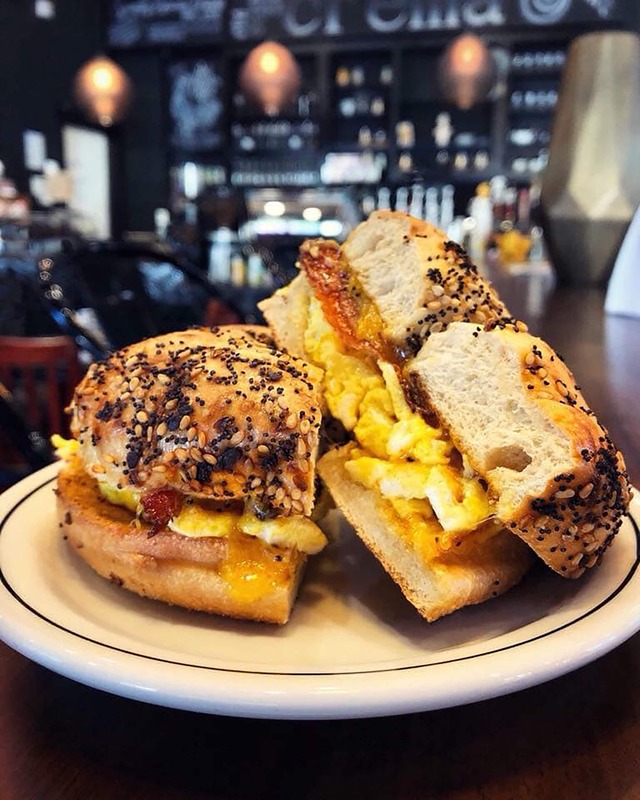 your choice of bagel, scrambled eggs, bacon and Tillamook cheddar. a light layer of tomato sauce sprinkled with mozzarella, egg white, a choice of chorizo or bacon on flatbread. Assorted daily selection of fresh muffins, cookies, and other baked goods all made fresh at our own bakery! All of our sandwiches come with a choice of creamy pasta salad or chips. a New Orleans classic…sliced salami, ham, mortadella, and provolone cheese served on a toasted ciabatta roll with a zesty olive & garlic tapenade. in house slow roasted beef top rounds thinly slice and serve inside a fresh baguette with imported brie cheese, Dijon mustard, and fresh greens. our exclusive chicken salad with tarragon served on our house baked croissant with mixed greens. fresh sliced turkey breast, lettuce, tomato, avocado, cucumber, mayo and provolone cheese served on fresh sour-dough bread. we discovered an old recipe for Jezebel Sauce and it’s perfect with our fresh sliced baked ham on sourdough bread with swiss cheese. hummus, cucumber, arugula, tomato, and peppers stuffed in a wrap. shaved pastrami, swiss cheese and sauerkraut topped with 1000 island dressind on rye. our classic three layer club with turkey, ham, bacon, mayo, lettuce, tomato with cheddar and Swiss cheese on fressh sourdough bread. all of our pizzas are fresh baked in our 1000 degree oven and made with only the finest ingredients available on your choice of our Italian thick, thin, or gluten free cauliflower crust. our delicious house made pizza sauce with a generous portion of fresh mozzarella cheese. classic pepperoni with mozzarella cheese and our house made pizza sauce. fresh peppers, onions, mushrooms, spinach, tomatoes, mozzarella cheese and house made pizza sauce. our own unique blend of quinoa, corn, red onions, tomatoes, black beans, avocado, cilantro, lime juice, and jalapenos served atop fresh spring mix. sliced beets mixed with cubed feta cheese and walnuts in our vinaigrette served atop fresh spring mix. our exclusive recipe of tarragon chicken salad served atop fresh spring mix. diced apples, dried cranberries, chopped walnuts and crumbled feta on a bed of mixed greens with a choice of dressing. spicy capicola ham, savory brie cheese, sliced apple, and our secret recipe jezebel sauce. a white pizza made with creamy bleu cheese, walnuts, honey and house made garlic butter spread. spicy chorizo, red onions, and mushrooms. kalamata olives, feta cheese, roasted peppers, and red onion. thin sliced prosciutto topped with fresh arugula. fresh goat cheese, spinach, roasted tomatoes. an assortment of sliced and rolled meats, hummus, olives, feta cheese, dried fruits and nuts, served with sliced toasted pita bread. an assortment of 4 imported and domestic cheeses (varies based on availability), dried fruits, nuts and pita bread. imported shaved Italian meats, specialty cheeses, olives, nuts, served with slices of toasted fresh baguettes. a generous portion of our fresh hummus and fresh veggie strips served with sliced toasted pita bread.